t+j Designs Blog: HOW TO: Make a statement...day + night! HOW TO: Make a statement...day + night! Eyeing a particular statement necklace that you can’t figure out what to pair it with? Here is a perfect “How to” guide for styling bold neck-pieces for any occasion, day or night! The statement necklace shown here is the Luxe Crystal necklace from T+J DESIGNS. Our day look consists of an over-sized cozy sweater, PROENZA SCHOULER high-waist denim and Labworks fringed charmeuse vest. Chunky high-low knits pair perfect with high-waist skinny denim and its fun (& practical for this cool weather!) to add some edge with a unique vest! Finally, we paired this chic-casual look with ALEXANDER WANG ankle boots & a T+J DESIGNS gold v-shaped bangle to bring in metallic touches from the necklace! This look is comfortable, chic & on-trend for any day occasion! The evening look we came up with is perfect for a night out on the town! We chose to pair the same statement necklace with a fun sequin crop top & leather-pleated mini from ALICE + OLIVIA. We love the idea of going bold with an already “blingy” top & accentuating it even more with the luxe necklace. Adding a classic black leather mini adds a flirty edge that we just can’t get enough of! To add a pop of color, we topped off the ensemble with an YVES SAINT LAURENT red trench. Finishing this daring get-up, we added a T+J DESIGNS black crystal square statement ring and couldn’t forget the ever-popular, red-soled, black ankle strap heels by CHRISTIAN LOUBOUTIN. 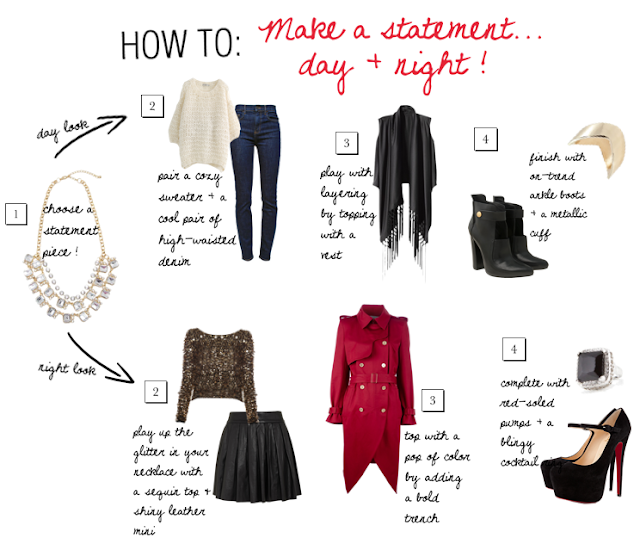 We hope this guide helps you to make a statement, no matter what time of day! Love the accessories featured above? Find them here!